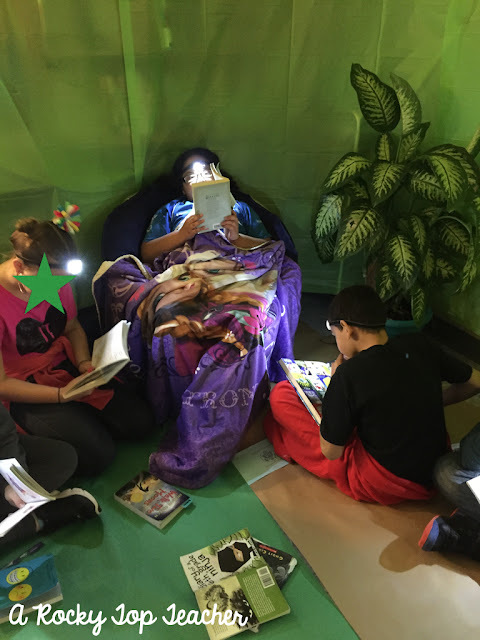 Last week, our fifth grade classes ended Read Across America week with an all day read-a-thon. 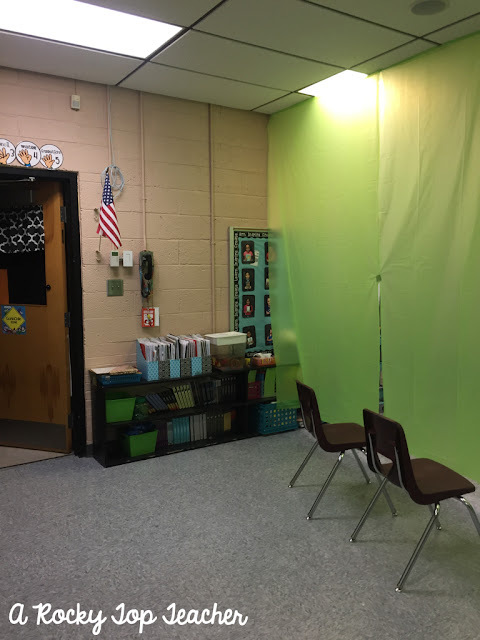 Each classroom was transformed into a different theme. 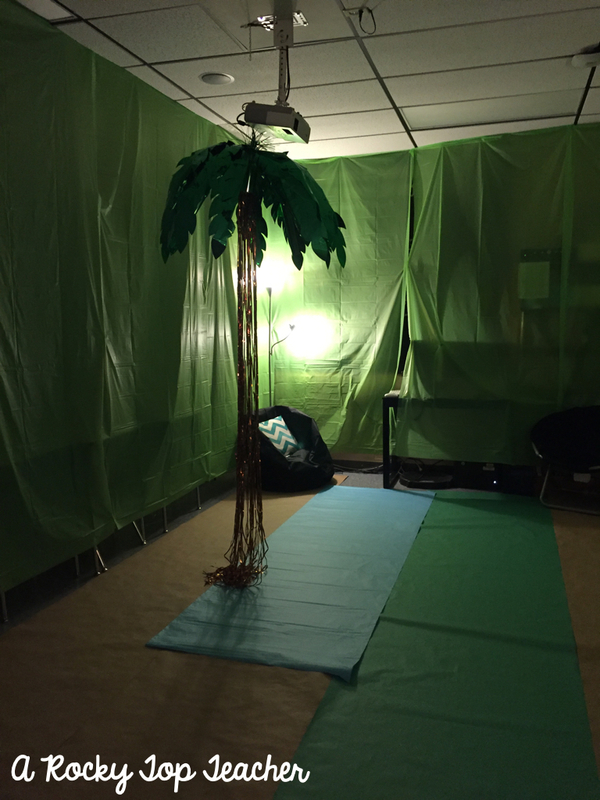 We had a beach room, space room, camping room, and jungle room. Our classroom got a jungle makeover, so I wanted to share a few pictures with you and some quick tips on how you can transform your room on a budget! 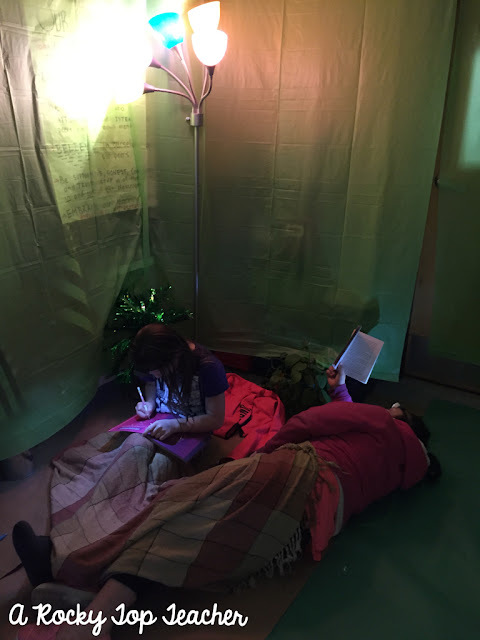 First tip--use plastic tablecloths! 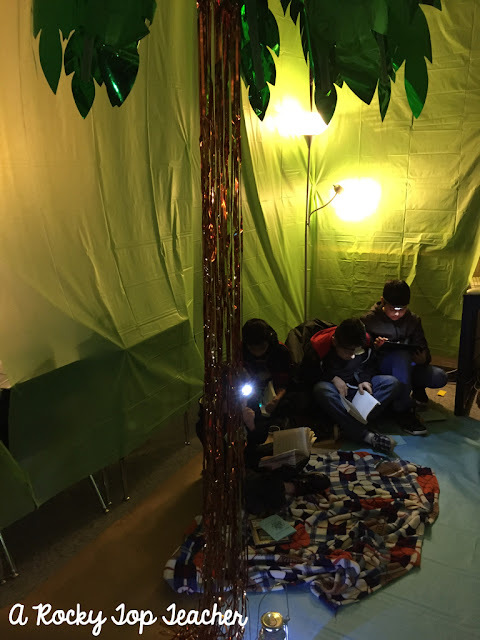 I trimmed my room in half for this quick transformation and used thumbtacks and green table cloth to make the "jungle walls". I love using table cloth for projects like this because you can get them in a variety of colors, they are cheap, and they are easy to work with! I did grab this fun tree from Hobby Lobby and a few smaller trees to help add some jungle decor. The floor is made with colored butcher and packaging paper. We moved all of our classroom lamps and plants over to the jungle side of the room. I also played jungle/rainforest music from Amazon all day. The sounds really helped pull everything together! 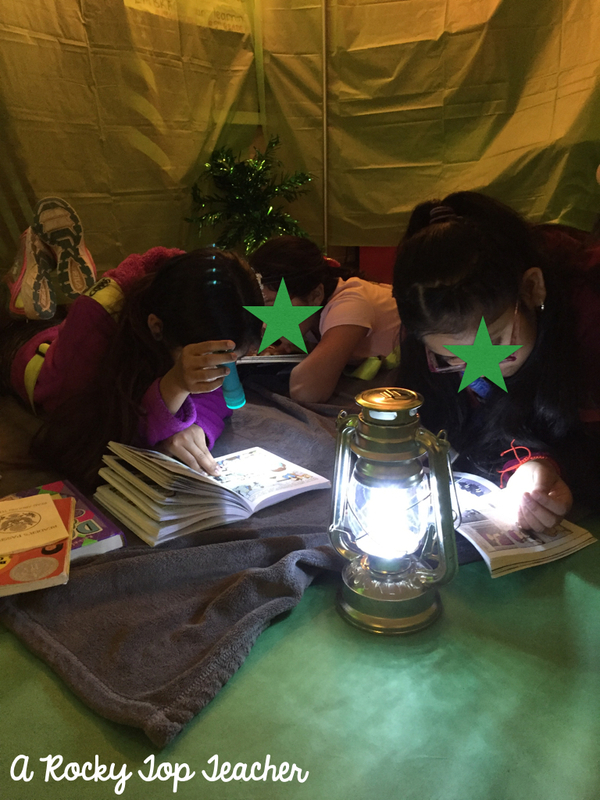 Our amazing librarian loaned us her camping lamps and students used head lamps for reading. We do a lot of "flashlight and glow in the dark" reading time so I have been collecting these $1 head lamps from Wal-Mart over the years. 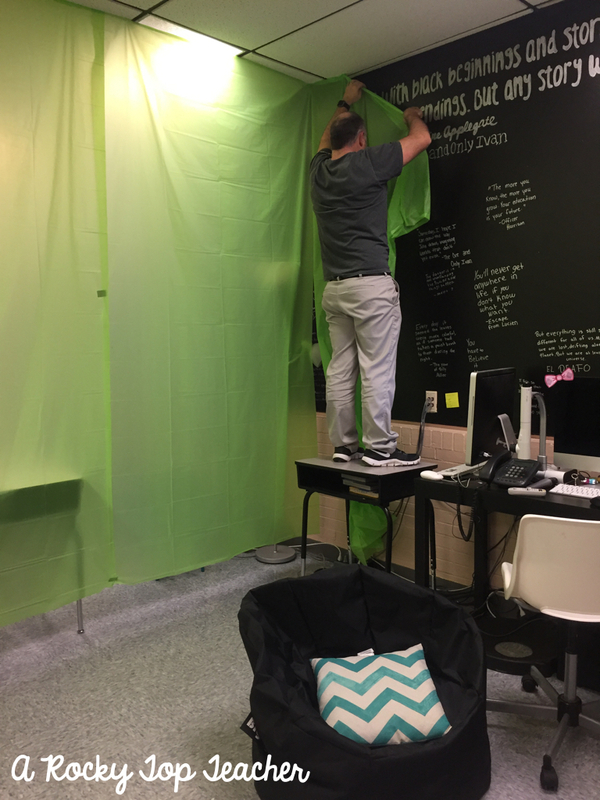 Normally, I would have cut out a hole in the tablecloth for our SmartBoard but it was way too bright for the room this time. 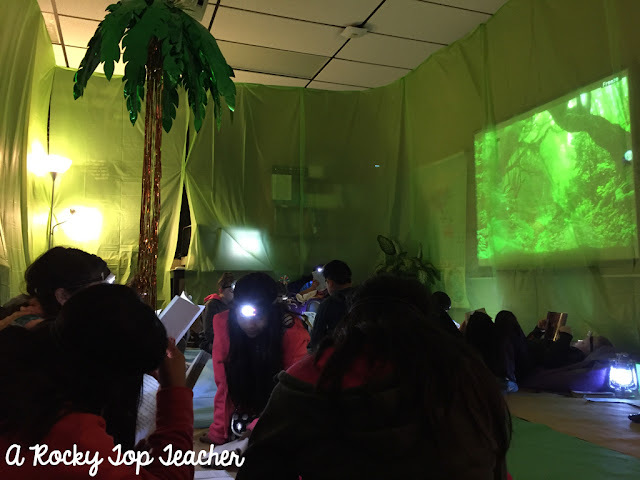 Keeping the tablecloth on top calmed down the light and still allowed us to display our jungle scenery. Since it was a read-a-thon, the students had a lot of time in each room to read to themselves or with partners. 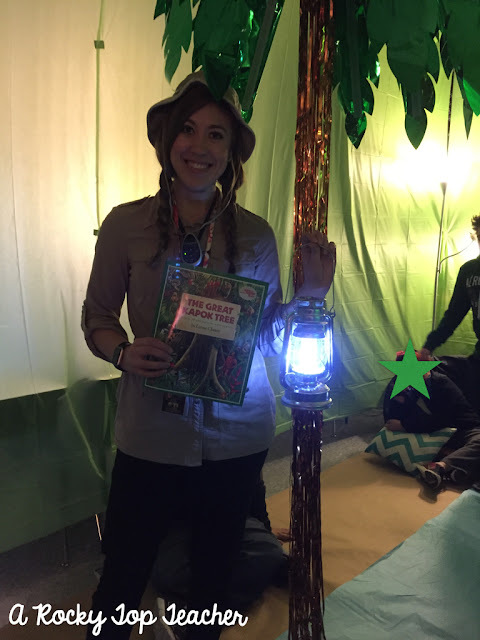 The teachers also had themed read-alouds that they shared with each class. The Great Kapok Tree by Lynne Cherry is one of my favorites and paired perfectly with our jungle theme. This picture book is a great resource if you are looking for a book to teach main idea and key details as well as cause and effect. 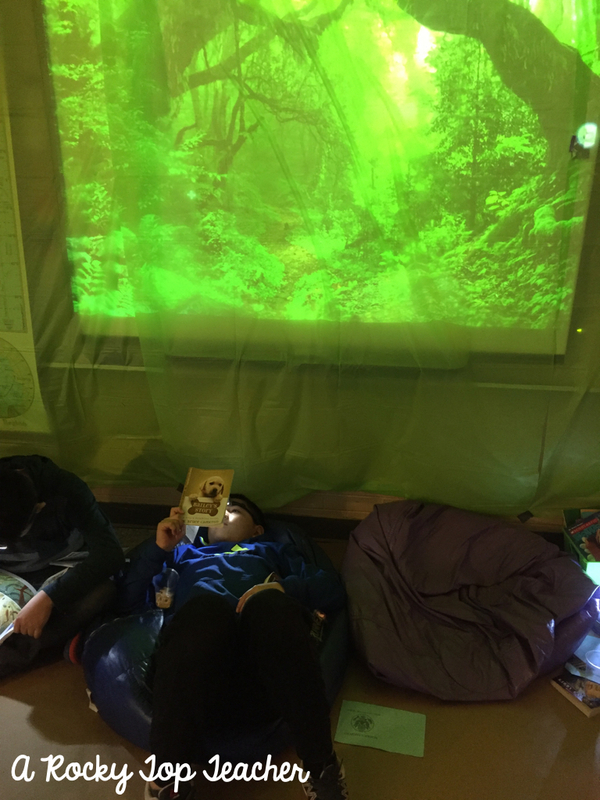 It was, hands down, one of our favorite days this school year!